St. Patrick’s Day, despite its religious roots, is one of the few global secular holidays where almost everyone celebrates using the same sets of rituals. Yesterday, all around the world millions dressed in green, held parades celebrating gingers and leprechaun, and headed to their favorite pubs to sip inordinate sums of Guinness all in the spirit of celebrating Irish culture. Everyone’s Irish on St. Patty’s Day, as the saying goes. sometimes it takes extraordinary events to really put things in perspective. And thanks in large part to the sports’ association with Ireland stateside, soccer suddenly becomes everyone’s second favorite sport on St. Patrick’s. Ireland and Celtic kits are just as much of staples as shamrocks and kilts. As a football fan in America, it’s great because, for once, you won’t get (as many) angry stares for having the bartender change one of the TV’s behind the bar to a match on a Saturday afternoon. This year’s St. Patty’s celebrations were particularly large due to the holiday being celebrated on a weekend for the first time since 2007, unseasonably warm temperatures, and because of the early tip-offs for NCAA March Madness basketball games. Since the wife and I regularly watch Tottenham matches at one of the only Irish pubs in Northern Cincinnati, we figured we would need to get there extra-early to make sure we got a seat at the bar to watch Spurs’ winnable FA Cup quarterfinal against Bolton. After the match, we had plans to meet up with some of my old high school buddies to continue paying tribute to the 5th century Irish priest. All said, it seemed the recipe for a great little Saturday. A full-parking lot awaited us when we arrived an hour and half before the 1:30 pm kickoff, the festivities already in full swing. As you might predict, most weren’t there for the football… but the more the merrier, right? However to our dismay, all of the bar stools that normally lined the bar had been removed to allow for the larger crowds they expected later in the day. Not only did this mean we would have to stand for the next hour and a half to keep our spot at the bar, but we’d also be standing another two hours for the duration of the match too. “At least it’s like a traditional match day pub experience in the UK,” I told my wife, trying to look on the bright side of the development. But once we settled into our spot, the friendly staff of bartenders we’d gotten to know over the last few years let us know that most of their normal taps had been removed in favor of more “Irish” brews in honor of the holiday. Grrrrrrr… well okay, I probably needed to have a few Guinness on St. Patty’s anyway. Though they did manage to make it up to us a bit, as they made an exception to their limited beverage list rules for the day to get my wife her favored Snakebites… it pays to be regulars. And while I appreciated that the pub brought in performers to give us some traditional Irish music to get everyone in the Irish spirit, it also meant that we didn’t get hear the match commentary or crowds like we normally would when watching at the Claddagh. Again, another minor annoyance, but we would survive. So when Bolton scored to take an early 6th minute lead thanks to yet another lapse on a set piece, saying I was on edge doesn’t really cover it. First the stools, then the beer, now this… nothing’s going my way today. Another pint and a 10th minute Kyle Walker equalizer helped to warm my pessimistic outlook, but as the half approached, I still worried. If Tottenham are knocked out by Bolton, this is totally going to ruin the rest of St. Patty’s. 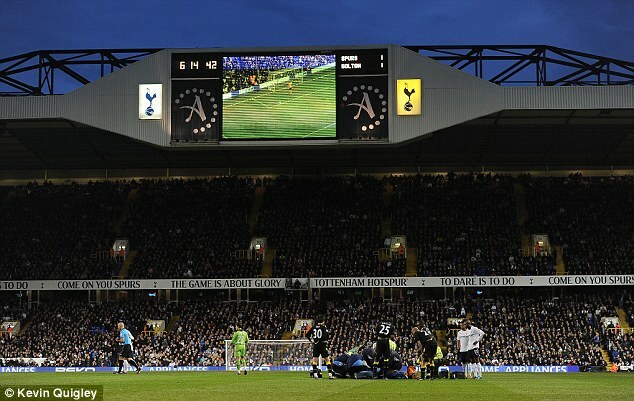 Then just four minutes before the expected half-time whistle, Bolton’s Fabrice Muamba collapsed face down on the pitch. I didn’t see any contact between the England U-23 international and anyone on Spurs. He’s just milking the clock, mock injury… get on with it kid. 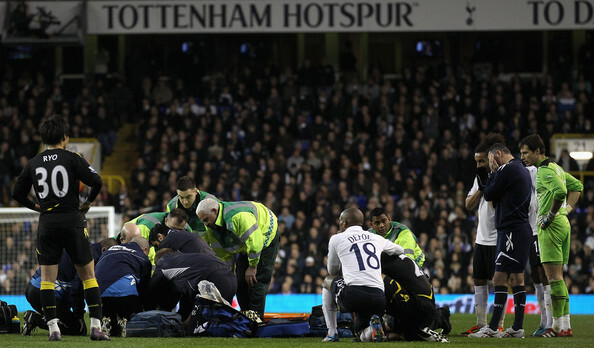 But when the first physio sprinted out and tried to flip a convulsing, limp Muamba on to his back, and then the cameras permanently cut away… we knew something far more serious was unfolding on the White Hart Lane pitch. even without context, you could tell something bad had happened here. As I mentioned earlier, the match volume was muted due to the St. Patty’s celebrations, so those of us watching the match had no clue what was happening. However, the images coming through the TV were enough to let us know the gravity of the situation, even without the commentators to clue us in. 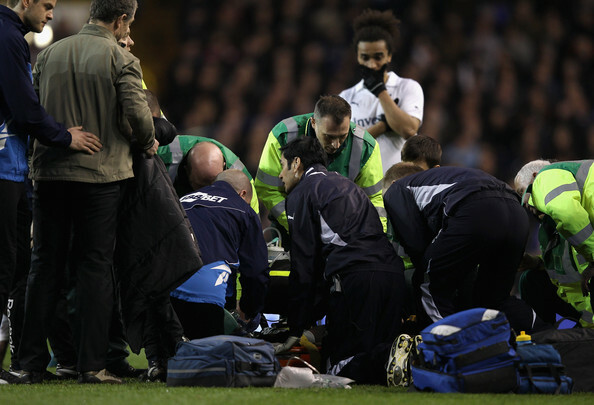 A distraught Assou-Ekotto, standing on the periphery of the now large group of physio’s treating Muamba, stood motionless with his gloved hands covering his face. Nigel Reo-Coker crouched close to his downed teammate, a face in shock. Rafa van der Vaart paced anxiously away, his hands locked in prayer. Wanderers’ boss Owen Coyle could be seen wiping tears from his eyes, an action emulated by multitudes of fans on both sides of the divide. Even referee Howard Webb, normally a bastion of calm, was visibly shaken. By the time the Fabrice was being stretchered off the pitch, the medical staff still performing CPR, we had pieced the evidence together. At the very least he wasn’t breathing, and possibly had suffered a heart attack. The club captains and managers, along with Webb, rightly decided to abandon the match. Suddenly, all of the petty little things that I thought might ruin my special “holiday” in the lead up to such a tragic event — no places to sit, a lack of match commentary, the bar not having my preferred beer on tap, Tottenham conceding another soft goal — seemed properly insignificant. It’s a bit embarrassing to admit that it took a player almost dying on pitch yesterday to make me realize how — in the big scheme of things — this is just a game and that there are more important things in life (sometimes) than which team of eleven men can kick a ball between the other’s sticks. If one positive thing is to be taken out of all of this, it’s better perspective. Watch this wrenching video of the entire experience and see how the fans of both teams joined together to chant the fallen player’s name. FAAA-BREEEEECE MUUU-AMMMBAAA… like they were willing him back to life. The physios were also showered with the cheers normally reserved for star players, finally proving just how invaluable they actually are in Muamba’s time of need. And Webb was even applauded for calling the match; an honorable reaction to a respectful decision. As others have said better than I, maybe it takes tragedy to help us, the footballing world, see the light. Here’s hoping that on St. Patty’s Day, Fabrice Muamba picked up a bit of that fabled Luck o’ the Irish I was so concerned with earlier… the boy’s going to need it much more than I.